Update: The fantastic tribute is the work of artist Chris Wharton. You can purchase t-shirts, prints, and more right here. For future reference, we want the iPhone case for the winter solstice. Life would be so much more awesome if this article was actually true. A Bill Murray comic comic book? Sign my kid up! I have the therapy sessions for 2025 scheduled, anyway. Our new pal Roland MacDonald (no relation) sent along the above fanart. My eyes burnt up when I saw this. I think that this is lame, but you are entitled to your own opinion (sort of). Our friend Jeffrey wonders if he has located *the* cove. Let us know what you think. I enjoy Chris Nolan’s work in general, but I watched the Blu-Ray and it has a thing where you can go to any scene in the movie and go to the making of that. There’s nothing that has ever made me feel less like a professional than watching Chris Nolan’s group at work. The remote-control miniature cars. Just every technique. The rehearsal of flipping the semi-trailer end over end in the middle of the desert before they blow it up in Chicago… There’s one scene where a guy jumps off the top of a skyscraper — they rehearse the jump but for the actual thing they did it CG. ‘But for the rehearsal you did jump off the building?’ ‘We have it as a reference.’ Wow. Chris Nolan is quite great. My favourite is Memento, but I’d like to learn how to do these things. The Village Voice’s 4Knots festival is today in New York City. Their poster brings to mind a certain Aquatic film. Finally, thanks to Gloria for her work on this weekly column (our condolences to her and her family). And sorry for ruining it by posting it a day late the one week that it is my job. The illustratographer received some fantastic Khaki Scout badges for his work on the movie. The Museum of the Moving Image in Astoria, Queens will be hosting a Wes Anderson retrospective titled “Wes Anderson’s Worlds” from May 18-27. Movies include the usual suspects and The Magnificent Ambersons, the film from which The Royal Tenebaums was largely inspired. Total Film somehow chose the 15 Greatest Wes Anderson Moments, a feat if I’ve ever heard one. Chuck Klosterman chose Rushmore as one of his top ten Criterions. We were deeply saddened to learn of the passing of Beastie Boy Adam Yauch. In addition to his massive musical legacy, he was also a daring director and founded Oscilloscope Laboratories, which in our estimation is bar none the best independent film distributor in the world. Yauch was also a passionate movie lover, and he was asked by Criterion to put together a list of his top ten favorite Criterion titles. His list is eclectic and knowledgeable, and it includes two Wes Anderson titles. You can see the list and read his funny, creative reasons (starting with #10 and going up) here. (Image above) Unofficial fan artwork of Moonrise Kingdom poster by Needle Design & Illustration. Comedian Rob Delaney brainstorms the next movie for Wes. Wes shares his inspirations for Moonrise Kingdom, including Ken Loach‘s 1979 film Black Jack, Alan Parker’s Melody, and François Truffaut’s Small Change. The Magnetic Eye did an interview with Jessica Hische, typographer and illustrator for the poster and title cards on Moonrise Kingdom. Production designer Mark Friedberg, who worked on the full-scale model of Zissou’s ship in The Life Aquatic, discusses working with Wes. 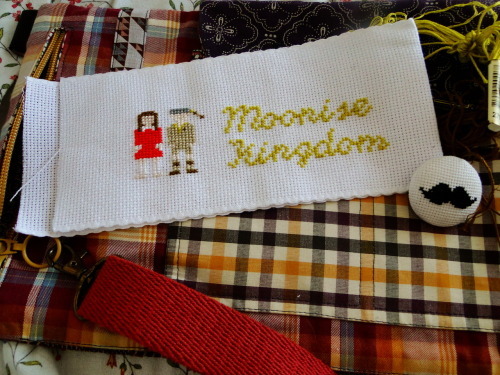 A Moonrise Kingdom treasury on Etsy.